I figured since I steal all your recipes I ought to contribute so here is our favorite pad thai recipe... It is from the weight watchers "take-out tonight!" cookbook. 1. Place the noodles in a large bowl and add enough hot water to cover; let stand until noddles are soft, about 10 minutes. Drain, transfer the noodles to a large bowl of cold water to cool, and drain again. Set aside. 2. Heat a large non stick skillet over medium-high heat. Swirl in the oil, then add the shrimp. Cook until the shrimp are just opaque in the center, about 3 minutes. Add the scallions and garlic. Cook until fragrant, about 10 seconds. Add the egg whites, stirring gently, until they begin to set, about 30 seconds. Add the fish sauce, sugar, chili sauce, and soy sauce; cook, stirring, until sugar dissolves, about 30 seconds. 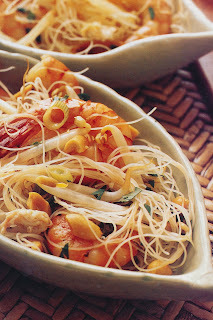 Add drained noodles and the bean sprouts; cook, tossing gently, until mixed and heated through, 2-3 minutes longer. Sprinkle with the peanuts and cilantro.